Oklahoma City, OK — The Devon Ice Rink opens to the public Friday, Nov. 11 at the Myriad Botanical Gardens as part of Downtown OKC Inc.’s Downtown in December celebration. Now in its sixth year at the Gardens, the Devon Ice Rink will be open through Jan. 31 and promises big fun for the whole family! Open seven days a week, the Devon Ice Rink hosts daily public skating, private parties and special events all winter long. Hit the ice on Friday nights for Rock ‘n’ Skate with a live DJ from 6 to 9 p.m. In addition to the new ice skating season, visit Scissortale Gifts at Myriad Gardens in the south lobby of the Crystal Bridge for unique holiday gifts, many made right in Oklahoma. Open every day from 9 a.m.-5 p.m. Proceeds help benefit the Myriad Gardens. · Monday – Thursday: 3 – 9 p.m.
· Friday: 3 – 11 p.m.
· Saturday: 11 a.m. – 11 p.m.
· Sunday: 11 a.m. – 7 p.m.
· Thanksgiving, Day 3-9 p.m.
· Friday after Thanksgiving, 11 a.m.-11 p.m.
o Monday-Saturday, 11 a.m -11 p.m.
o Sunday, 11 a.m -7 p.m.
o Christmas Day, 11 a.m -7 p.m.
o New Year’s Eve, 11 a.m -1 a.m.
· Martin Luther King, Jr. Day, January 16, 11a.m.-11 p.m.
For more information about the Devon Ice Rink, Myriad Botanical Gardens or Downtown in December, visit www.devonicerink.com, www.myriadgardens.org, or www.downtownindecember.com; or call (405) 708-6499. Myriad Botanical Gardens is located at 301 W. Reno, in downtown Oklahoma City. 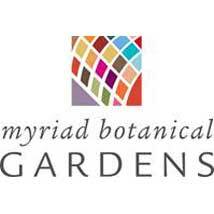 For more information about the Gardens call (405) 445-7080 or visit myriadgardens.org. Friday Nights are Rock n’ Skate Night! Friday nights for Rock ‘n’ Skate with a live DJ from 6 to 9 p.m. You can skate to a variety of music that makes you move including disco, rock n’ roll, country, & pop music and always more! Did you ever watch the Olympics and think ‘Hey, I want to do that!” Well, here’s one Olympic sport you can do. For one and a half hours, the Oklahoma Curling Club will walk you through the basic rules and etiquette of curling, explain the how’s and why’s of delivering and sweeping a stone, and get you on the ice enjoying the sport of curling together! Dress warm, wear rubber soled shoes, and prepare for the most fun you can have with a broom this side of Quidditch! All other equipment will be provided by the Oklahoma Curling Club. The Myriad Botanical Gardens is one of Oklahoma City’s most beloved public spaces, offering its visitors a 15 acre natural escape in the very heart of downtown. A half-acre children’s garden, an off-leash dog park, splash fountains, and paths for walking and jogging provide guests young and old with a place to seek solitude with nature, or seek community and the company of others. Additionally, the Myriad Gardens offers a variety of horticultural education programs for adults and children. The Crystal Bridge Tropical Conservatory’s unique design has earned attention and praise in the architectural community. It is 224 feet long, 70 feet in diameter, and is covered by 3,028 sections of translucent, double-layered acrylic panels. The Conservatory includes 13,000 square feet of plant display area in two distinct climates: the Tropical Wet Zone, which is at the south end and is watered daily; and the Tropical Dry Zone at the north end which receives water from April through September, followed by drought from November through March. Some 700 varieties of plants and a cascading waterfall round out the spectacular features of the Conservatory.